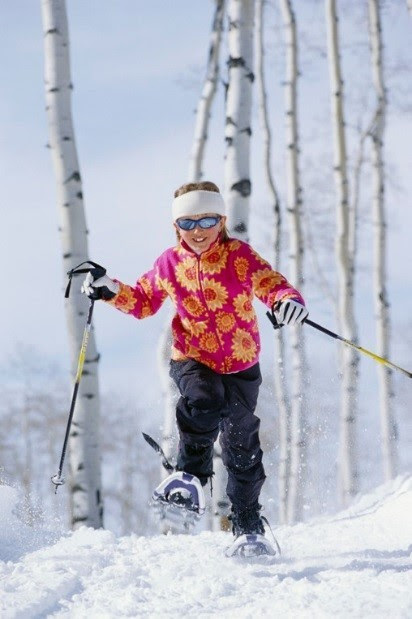 Use snowshoes or skis in deep snow to reduce injuries and ease travel. Their use also prevents “post-holing”—leaving deep footprints in the snow – which makes trails more difficult and hazardous for others to use. Snowshoes or skis are required in the High Peaks Wilderness. Pack proper gear for a winter hike to be prepared for anything. Know your skill level and physical capabilities. Choose trails within your or your group’s ability. Remember it takes more effort and energy to move through snow. Sun protection is just as important with the droppingSnowshoer with sun protection temperatures as it is in the heat of summer. Don’t be misled by the cold, always wear sunscreen or UV protected clothing when out recreating. Even in the cold, the sun still emits dangerous UV rays. Sunglasses are more important for eye protection in the winter. The intensity of sunlight is increased significantly when reflects off bright white snow. Polarized lenses with UV protection are best when recreating on a sunny winter day. Winter camping tip; cozy up to your Nalgene. Use a hot water bottle to stay warm for hours. Boil water before bed, pour the hot water in your plastic water bottle (like a Nalgene) and place water bottle in a sock so that you do not burn yourself. Snuggle up in your sleeping bag with your water bottle for hours of warmth. In the morning, your water will be perfect temperature for drinking or reheat it for your morning breakfast. Stay on deep snow whenever possible. Snow deeper than 6 inches adequately protects underlying vegetation from trampling with the exception of vulnerable alpine vegetation found on 16 of the Adirondack high peak summits. Thus, nearly any surface outside of the Alpine Zone that is covered by enough snow is considered “durable”. 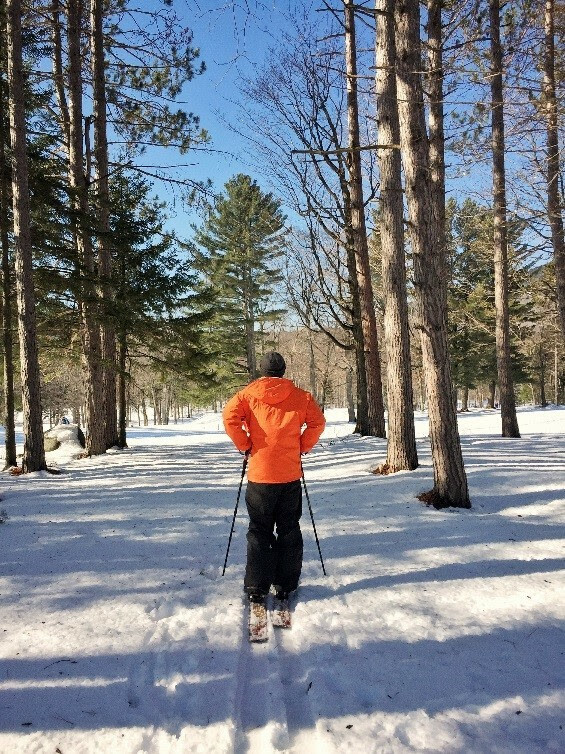 Wearing snowshoes or skis further protects trails and natural resources. Share the trail and yield to downhill and faster users. Skiers and snowshoers using designated snowmobile trails should keep to the side and move off the trail to allow safe passage of snowmobiles. Snowmobilers should slow down when passing skiers and snowshoers. Learn the conditions you will encounter from Backcountry Information for the Adirondacks webpages. Winter Conditions (below freezing temperatures, snow, and ice) are present throughout the Adirondacks. Snow depths range from 8 to 15 inches. See the NERFC Snow Page for current snow information. Learn how to have a safe and enjoyable outdoor winter experience. Mountain Summit Conditions will be more extreme than those found at the trailhead. Temperatures will be colder, winds will be stronger, wind chill temperatures will be much lower, and snow will be deeper. Check the National Weather Service Mountain Point Forecasts for selected summits. Trail Conditions: Snow and ice is present on all trails and at all elevations. The use of snowshoes or skis is warranted throughout the Adirondacks. Traction devices, such as microspikes, should be carried and used on icy, exposed areas. Crampons should be carried and used on icy summits and other areas of thick ice build-up. Ice on River and Streams: Many rivers and streams lost ice during last weekend’s rain. on the surface of most water bodies. Ice over moving water may have only recently formed and is thin. Ice may be perched above the current water level of streams as ice formed when the water levels were higher. Use caution at stream crossings. Ice on Lakes and Ponds: Ice is present on the surface lakes and ponds. Layers of water, slush, and ice will likely be present under the snow and above the main surface of ice. Be safe on ice. Near boathouses & docks – especially those with “bubblers” or other ice prevention devices. Remember, ice that holds snow may not hold the weight of a person or snowmobile. McKenzie Mountain Wilderness: The first bridge on the Jackrabbit Trail between McKenzie Pond Road and McKenzie Pond is flooded and impassable. The stream is not safe to cross. Skiers and snowshoers should avoid this portion of the trail until further notice. Grass River Conservation Easement Tract: DEC Region 6 Operations staff and the St. Lawrence County Snowmobile Association worked together to replace the deficient DChap Hill Bridge on a snowmobile trail in the town of Colton with a stronger, portable bridge from the nearby Goldmine Tract Conservation Easement. High Peaks Wilderness: Lake Colden Caretaker reports 26 inches (65 cm) of snow at the stake on the shores of Lake Colden (Elevation 2,750 ft./838 m) and 3 to 4 feet (91 to 122 cm) in the higher elevations. High elevation trails lost a lot of snow in last weekend’s rain. Although additional snows have fallen, many trails are “bony” in locations where rocks and other obstacles are present. South Meadow Lane and the Marcy Truck Trail are skiable but may be “bony” in some locations. The beaver dam on the outlet between Avalanche Lake and Lake Colden blew out during last weekend’s high water. Avoid ice around the inlets and outlets of both lakes. High waters last weekend blew out snow and ice at crossings on the Opalescent and other high elevation streams. Water levels have dropped and ice is reforming but caution should be used at stream crossings. Sable Highlands Conservation Easement Tract: DEC reminds snowmobilers that only Wolf Pond Mountain Road and Liberty Road are open to snowmobiles. Recently snowmobiles have been illegally using Goat Path Road, Piney Ridge Road, and D&H Road which are being used by logging trucks. These, and all other roads except for Wolf Pond Mountain Road and Liberty Road are closed to snowmobiles. Blue Ridge Wilderness: The Wakely Mountain Trail remains closed until further notice due to safety concerns with the Wakely Mountain Fire Tower. The fire tower was closed to public access in December 2016 due to structural deficiencies. The condition of the tower has worsened and it is possible the tower may collapse in heavy winds. DEC plans to replace all of the footings in 2018 and reopen the trail and the fire tower. This trail system located on the southwestern shore of Lake Placid consists of three trails loops – Boundary Trail, Ridge Trail, and Lakeshore Trail – bisected by an old dirt roadway. The trails wind over gently rolling terrain and are self-guided nature trails that may be explored using the brochures provided at the trailhead by the Lake Placid Garden Club. These trails are great for XC skiing or snowshoeing in the winter. Corridor Trail: This trail is the initial trail that accesses the trail network. From the gate you descend slightly to a trail register. The trail continues to descend and eventually flattens out as it accesses the other three trails. It ends at the start of the Ridge Trail and is 0.75 mile in length, one way, 10-15 minutes travel time. Boundary Trail: This trail is can also be considered a connector trail. It is relatively flat with little change in elevation. 0.9 mile in length, one way, 10-15 minutes travel time. Ridge Trail: The trail starts from the end of the Corridor Trail and climbs steadily to the top of a long ridge. The trail then drops suddenly about 20 feet before moderately descending through a very attractive forest to the Boundary Trail. 0.7 mile in length, one way, 10-15 minutes travel time. Lake Shore Trail: The trail follows the shore of Lake Placid before ending at a dam. The trail is much rockier and uneven than the rest of the trail, but is a highlight of the system. 0.4 mile in length, one way, 10-15 minutes travel time. This trail can be more difficult on XC skis.